Aloveen Shampoo and Aloveen Intensive Conditioner can be used on any dog or cat that enjoys a moisturising, lightly fragranced shampoo, and helps those who suffer from dry and itchy skin. The Aloveen range can be used at any age on dogs, puppies, cats and kittens. Aloveen is also ideal for dog and cats with allergies. Pets with allergies often suffer from dry and itchy skin. Two common types of skin problems include ATOPY and CONTACT ALLERGY. Atopy is often used to refer to a condition of suffering multiple allergies, including those to various airborne pathogens, dust mites and pollens. A contact allergy can be caused by anything that the animal's skin comes into contact with, such as certain types of grasses. It usually causes irritation of the feet and belly. Wet animal thoroughly with water. Apply Aloveen Shampoo at several points and massage into the coat gently. A sponge may assist lathering and penetration of the coat. Leave on for 5 minutes then rinse off with clean water. 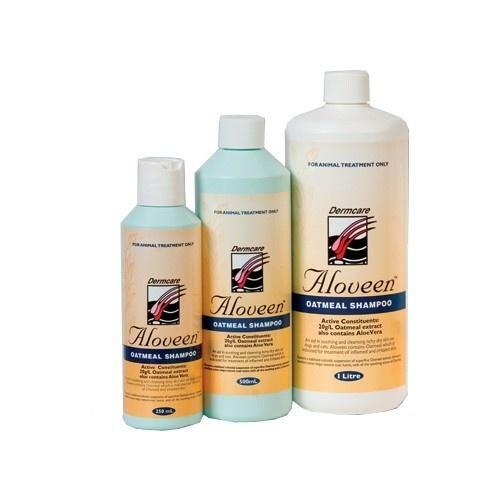 Use Aloveen Conditioner to prolong the soothing effects and to add extra gloss and manageability to the coat.